Behold Morocco’s opulent cities, traditional culture and awe-inspiring landscapes on this five-star journey thorough the jewel of North Africa. From Imperial Cities to UNESCO World Heritage Sites, explore sultry souks and lavish palaces, walk through the High Atlas Mountains, stroll on ocean shores and get happily lost in labyrinthine of medinas where snake charmers and acrobats emerge at dusk. Tours with expert local guides reveal the stories behind the sights, while private chauffeured vehicles are happily at your service throughout your journey. Make your way to the Imperial City of Meknes, known as the "Moroccan Versailles" and visit ancient ruins, mausoleums and try to take in the 25-mile-long walls that surround the city. 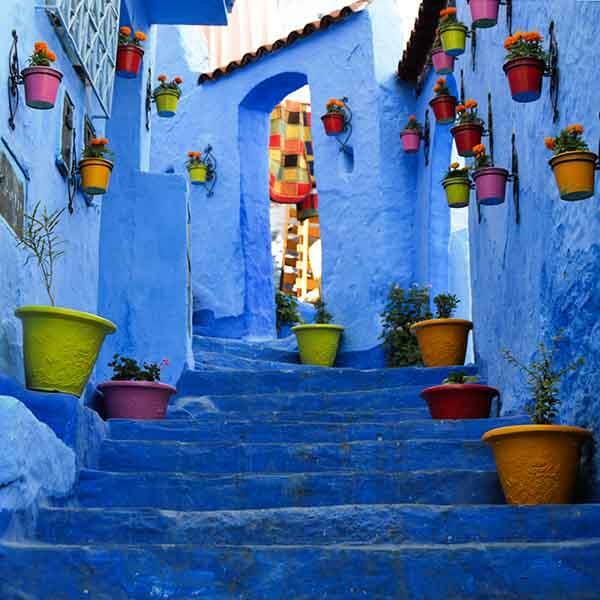 Enjoy a guided tour of Fez, considered the most beautiful city in North Africa, and visit the many artisan shops that line its 9000 narrow passageways and bustling streets. Set out on a rugged adventure in your own 4X4 vehicle towards the dunes of Erg Chebbi, possibly the largest dunes in the Sahara desert, for a memorable camel ride, then watch the sun set over the red earth from your dreamy tented camp. Make your way to marvelous Marrakech and tour the 12th century Koutoubia Mosque, the El-Bahia Palace, the famous Saadian Tombs and venture into the High Atlas Mountains for a taste of Berber hospitality. From refined riads tucked away on charming cobbled streets, to premium tented desert camps under dazzling stars, relax in exclusive accommodations which offer luxurious sophistication and warm Moroccan charms.